Have you or your loved one been harmed in an 18-wheeler truck accident due to the negligence of a tractor-trailer truck driver? Commercial trucks are an essential part of our society and economy. However, when a commercial truck is involved in an accident with a passenger vehicle, the damage is typically catastrophic. The federal government highly regulates the Trucking Industry. These regulations are strict and are necessary to reduce the instances of truck accidents. Also, regulations are in place to protect the legal rights of accident victims. For example, 18-wheeler trucks are required to carry substantially more accident liability insurance than non-commercial drivers. According to the United States Department of Transportation’s Financial Responsibility Requirements for Commercial Motor Vehicles, the minimum liability insurance coverage for commercial truck ranges from $750,000 to $5,000,000. This level of commercial truck liability insurance is necessary because of the weight and size difference between a commercial vehicle, and a typical passenger vehicle is substantial. When the driver of a commercial truck causes an accident, the accident is usually catastrophic. Not only will the passenger vehicle likely be a “total loss” after a crash, but the passengers in the car, SUV or pick-up truck will likely be severely injured or fatally wounded. Why Hire an Attorney for Your Truck Accident Case? Truck accident cases are complicated, and these cases are routinely and rigorously defended by the insurance company of the at-fault trucking company, truck driver or both. This is because the payout on such claims can reach close to $1 million or more. If you or a loved one has sustained any harm due to a truck accident caused by a negligent truck driver, contact Rees Law Firm for your free, no-obligation trucking accident consultation. Rees Law Firm is an experienced and aggressive truck accident law firm based in Jonesboro, Arkansas. 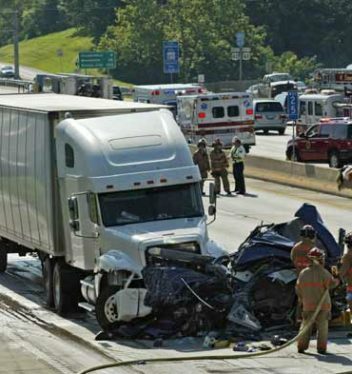 Our truck accident attorney in Jonesboro represents claimants throughout the State of Arkansas. Call Rees Law firm at (870) 931-2100 for your free, no-obligation consultation. At Rees Law Firm, our clients ALWAYS come first. Call to receive the information you need to protect your legal right to fair, legal compensation. What Services Does an Attorney Offer? Reviewing the important legal documents and insurance policies. Preparing and filing your truck accident claim properly and by the statute of limitations or deadline. Settlement negotiations with the truck insurance company attorneys. Advising and ensuring proper medical examination and treatment of injuries. What Are the Common Reasons People Retain a Lawyer? The insurance company denied liability. The insurance company is uncooperative. The accident victim or family of the decedent did not accept the settlement offer by the insurance company. The accident victim feels they will recover more money by retaining an attorney. According to a National Highway Transportation Safety Administration report, Arkansas had about 75 fatal truck accidents in 2014. Unfortunately, the number of truck accidents in Arkansas has been on the rise over the past several years. It is believed that the reason for the slight annual increase of truck accidents in Arkansas is caused, in part, by the increased number of trucks on Arkansas’ roadways. If you are in an accident in the State of Arkansas and the damage or bodily injury expenses exceed $1,000, you are required by law to you fill out an Arkansas Motor Vehicle Accident Report (SR-1) form within 30 days of the date of the accident. You are also required to fill out an Arkansas Motor Vehicle Accident Report (SR-1) if someone is killed in the accident. The Jonesboro truck accident lawyers at Rees Law Firm offer a free, no-obligation consultation when you call (870) 931-2100. Empower yourself to recover full and just compensation for your losses. There are several myths and misunderstanding about Truck accident claims that our law firm would like to address for your benefit. We hope that you will avoid deciding without first receiving qualified legal advice to ensure that you do not damage your case. Myth #1 – Retaining a lawyer for your truck accident claim means you recover less money. The Insurance Research Council performed a study to determine why people chose an attorney to represent them in an accident case. The study also polled over 35,000 accident claimants and asked them, if they received more or less money when they hired an attorney versus their first settlement offer. The study also polled the accident claimants how much more or less money did you receive because of retaining an attorney. The Insurance Research Council performed a study found that accident injury settlements paid to claimants who retain a lawyer recovered 40 percent more money for their claim versus those individuals who handled their claim without an attorney. Similar studies suggest that the reason why accident claimants are more likely to recover more money for their claim is that people without an attorney are taken advantage of by the insurance company by devaluing their claim. Myth #2 – Hiring a truck accident lawyer will create unnecessary delays. If an insurance company makes you an offer, you can accept this offer and settle your claim. However, if you rush to accept a quick settlement offer from the trucking insurance company, you could be unknowingly forfeiting all the money you could be legally qualified to receive. In other words, a quick settlement could result in your receiving less money than you are entitled to receive. Also, accepting a quick insurance settlement check will likely bar you from receiving any more money down the road for unforeseen repair bills, medical expenses or any other accident-related costs that may arise in the future. An experienced Jonesboro truck accident attorney is skilled at uncovering all the possible avenues and coverages to help you collect the maximum, legal compensation that your case truly deserves. For example, there may be other third parties or other truck accident insurance policies that could be pursued to recover additional compensation for your claim. Treatment costs for undiagnosed injuries that appear in the future. Additional vehicle repairs and diminished value of your property. Contact the Jonesboro truck accident lawyers at Rees Law Firm at (870) 931-2100 for your free, no-obligation consultation. Why Choose the Rees Law Firm for Your Truck Accident in Jonesboro? The Rees Law Firm has established a reputation quality legal representation. Attorney Mark Rees has received several awards and accolades and was recently named “BEST OF THE BEST ATTORNEY” by the readers of the Jonesboro Sun and Occasion’s Magazine. The staff and attorneys at Rees Law Firm understand how important communication is to you and your family. Our legal professionals will ensure that your calls are returned promptly and that you are updated on the progress of your truck accident case. Attorney Mark Rees offers you a free truck accident case evaluation by phone or at our Jonesboro, Arkansas law office. Call Rees Law Firm at (870) 931-2100 to learn about your legal rights and receive answers to your truck accident questions.